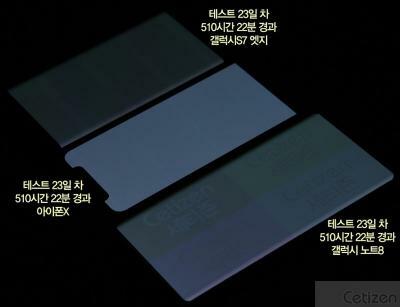 Korea's Cetizen posted an interesting review of the burn-in of 3 flagship OLED phones, the iPhone X, the S7 Edge and the Note 8. Cetizen displayed the same image on all three phones for 510 hours (!) at full brightness. As you can see in the image above, the Note 8 has very visible burn-in, while the two other phones perform better. Cetizen say that the iPhone has the best display in that regard. Apple did in fact confirm that the iPhone X suffers from burn in, but also said that it engineered the display to be the best in the industry in reducing the effect of OLED burn-in, though - and apparently this engineering works. I hope that these tests used three new devices, as OLEDs always degrade in time. But this should be a wake up call for Samsung and all other display makers (LG Display too, of course). Burn-in is a problem but with the right calibration and engineering it can be overcome.